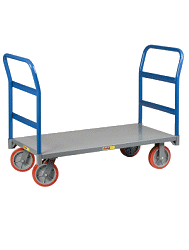 The extra tall frame on these hand trucks make it perfect for transporting ligher items such as snacks and pastries. Save time, save money! Skids on the rear of the hand truck make it easy to remove the truck from the back of delivery trucks. A tall frame and long tubular folding nose allows for stacking product for fewer trips.